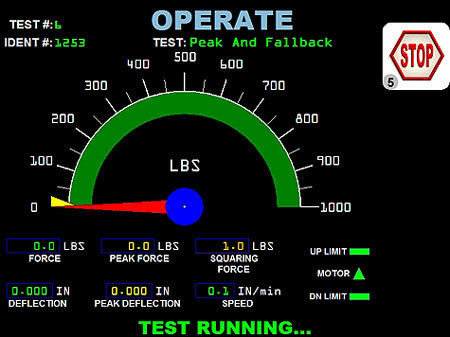 Emerson Apparatus has pioneered software connectivity with its Compression Testers and Crush Testers. All of our testing equipment comes pre-loaded with the latest software versions, which literally makes them ready to plug in and use “as-is” with little set-up required. 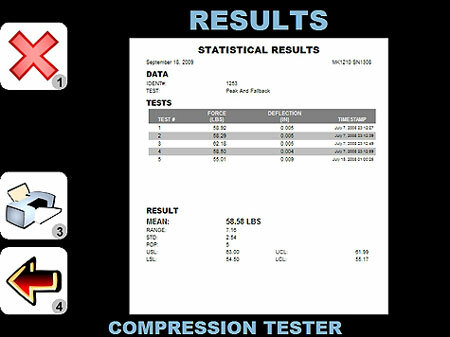 Preview Emerson’s Compression Tester Software which uses familiar Windows-based screens and navigation aids to provide an intuitive and user-friendly interface to your Compression Tester equipment. 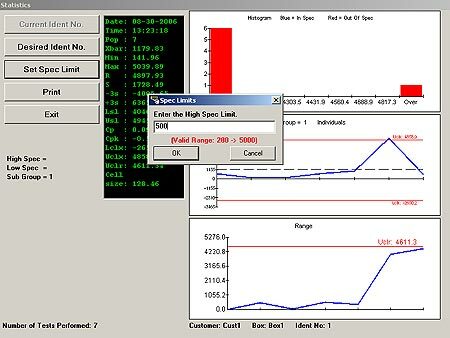 Data management is easy with our NIST-approved statistical process control (SPC), histograms, and control charts. 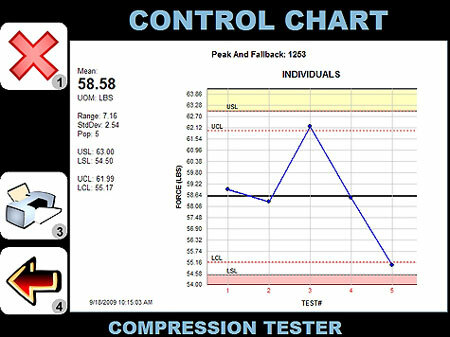 MAIN MENU–With just a few key strokes, the Compression Tester’s “Main Menu” screen allows users to select test types, run tests, control the compression tester platen, search statistical reports, plot graphs, and/or view graphs on screen. TEST EXPLORER–With the “Test Explorer” feature, users set up customer box types with specific parameters for each test. Users can also review desired test results and view single plots or superimpose multiple plots on one graph. 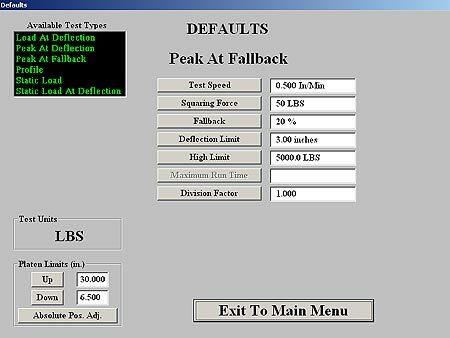 PEAK AT FALLBACK–The “Peak at Fallback” menu lets users select the test type for the current Customer, Product and Test Group; adjust test parameters, adjust product dimensional limits, and compensate for platen opening changes caused by fixtures. 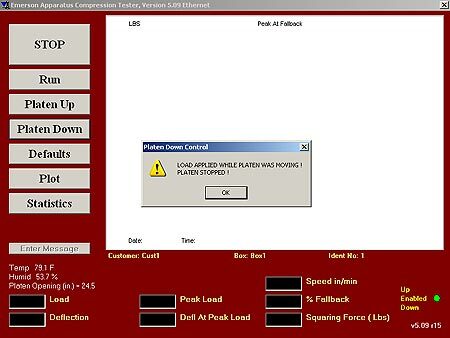 LOAD APPLIED SAFETY FEATURE–Should anything come in contact with the bottom platen while the machine is traveling down at fast speed, the Compression Tester’s “load cell” senses it and this safety feature stops the machine, preventing damage or erroneous test results. MULTIPLE PLOTS CURVE–Users can select up to 6 plots and overlay them all on one page, displaying information about each plot. Ideal for comparing test results on one chart. 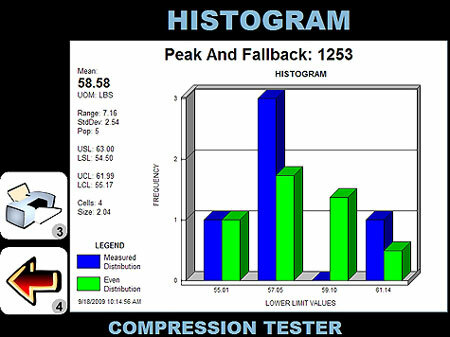 HISTOGRAM–The software’s robust statistics package allows users to view statistical data for a variety of test results in the form of histograms. 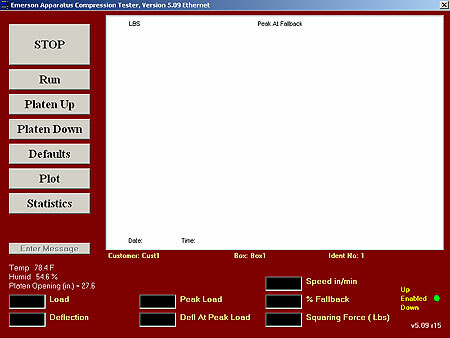 Contact Emerson’s sales team today about Compression Tester software. *Where IDD is your international dialing prefix as may be required when making international calls to the United States. 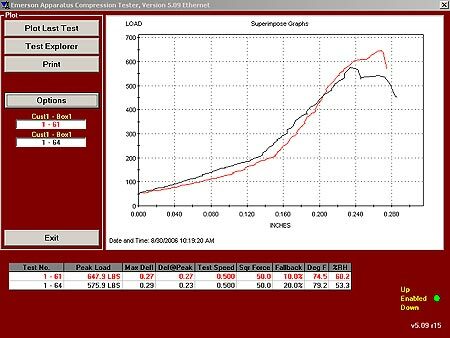 Preview Emerson’s Software for Models 1210 & 2210. New hardware and software adds accuracy, speed, is current with today’s technology, and provides storage for thousands of test results. PLUS you get additional reporting features, data logging capabilities, the ability to output files as .CSV and plot data points with MS EXCEL, advanced graphics, increased dynamic response, and much more! TEST SETTINGS–From the main menu, you can select a specific test type that has been pre-programmed with the TAPPI Specifications. 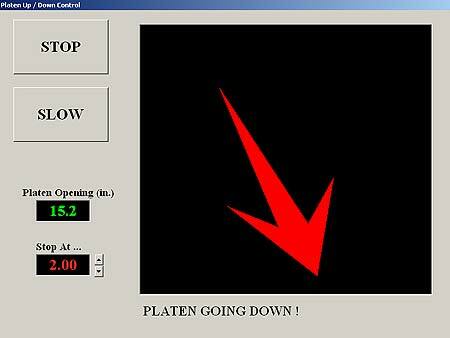 This screen shows a “Peak at Fallback” test where buttons for changing test parameters are available. For ECT and all other preset TAPPI tests, parameters are pre-determined and you can assign a specific numeric ID to the product being tested. OPERATE SCREEN–This screen shows the machine running a test. It includes actual force, peak force, actual deflection, and peak deflection, selected squaring force, selected speed, and indicators showing the status of upper limits, lower limits, and that the motor is enabled. 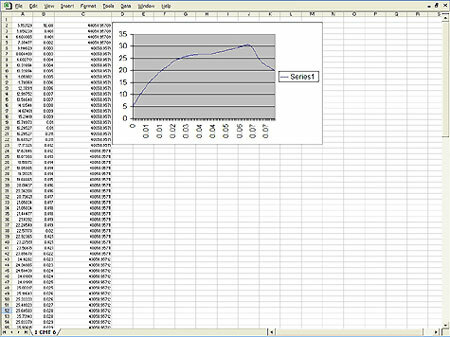 .CSV OUTPUT–Download a “.CSV” file to a pen drive and use Microsoft EXCEL to plot the data points captured throughout the entire test as an ‘XY’ curve showing force vs. deflection. 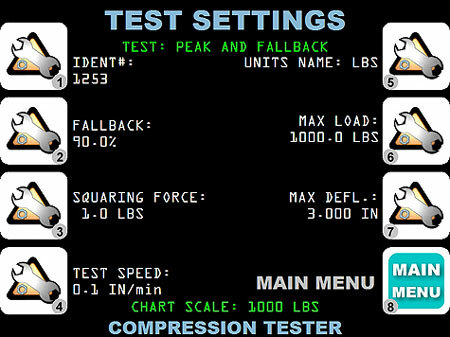 RESULTS SCREEN–This screen shows test data in text form (including peak force and deflection). HISTOGRAM SCREEN–This screen lets you view test data in bar graph form. 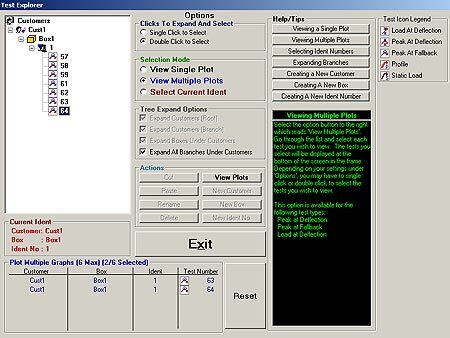 This screen lets you view results as test data points connected by lines to show whether the product being tested is within the set control limits. Contact Emerson’s sales team today about Model 1210 or 2210 Crush Tester software.